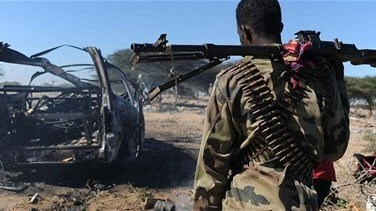 An air strike killed the deputy leader of the Islamic State group in Somalia's semi-autonomous Puntland region, alongside another militant, a local security official said on Sunday. "Today's air strike killed Abdihakim Dhuqub, the deputy leader of Islamic State," Puntland's security minister, Abdisamad Mohamed Galan, told Reuters. "Several missiles hit a Suzuki car. Then helicopters hovered over the scene," Mohamed Iid, a resident of Xiriiro, told Reuters. "It was a deafening air strike. We reached the scene after the helicopters left. The car completely melted." "(If) you take into account that they've never done a large terror attack in several years of operation, you basically have a gang stuck out in the desert," he told Reuters by telephone. "Just because they are called ISIS, it doesn't make them an existential threat."